Sometimes I feel a little claustrophobic. We are a family of 6 living in a little over 1000 sq. feet. I know that we are incredibly blessed to have a home to call our own, and I LOVE our house! I really do! But there are days where I feel like the walls are caving in, and on those days I spend way too much time thinking about my dream home… A beautiful 3000 sq ft home nestled safely at the end of a cul-de-sac, with enough space for us to breathe. Surrounded by trees and a luscious garden, and a yard where my kids can run amuck… and we’ll have a garage, and a kitchen with enough counter space to cook a meal… sigh… It’s a beautiful dream. But it’s just that. A dream. 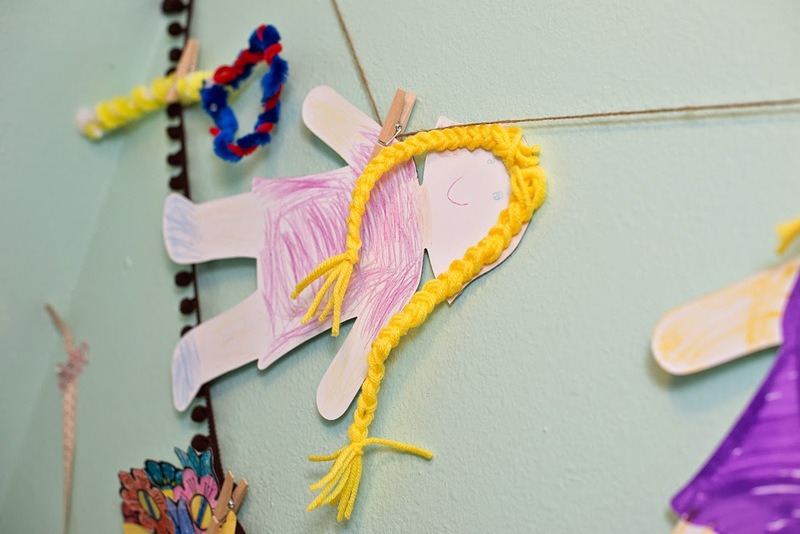 One of the biggest items on my wish list is a playroom. 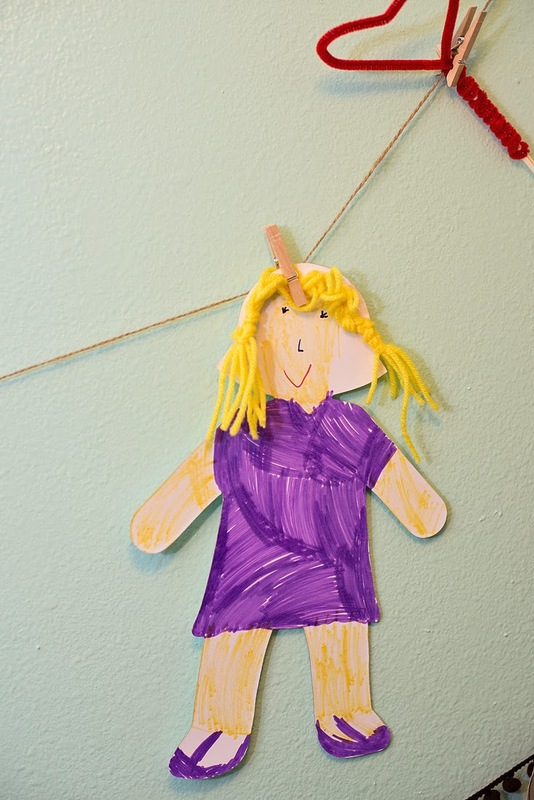 I’d love to have a space where the kids can imagine, play, and create… and where I can close the door to contain the mess and pretend like it isn't there if I have to. This week while I was doing some deep cleaning in our closet under the stairs I decided… hey… if I want a playroom so badly, why don’t I just make one?! Now I’m totally kicking myself for not taking a before picture of what this closet looked like. But I didn’t realize I was going to be doing anything fun or exciting when I started my de-junking mission that morning. Sorry! There are no pictures of the total disaster that existed under my stairs. Imagine with me for a moment a closet so scary that you didn’t dare open the door lest something fall out of its precariously stacked location and knock you on the noggin. 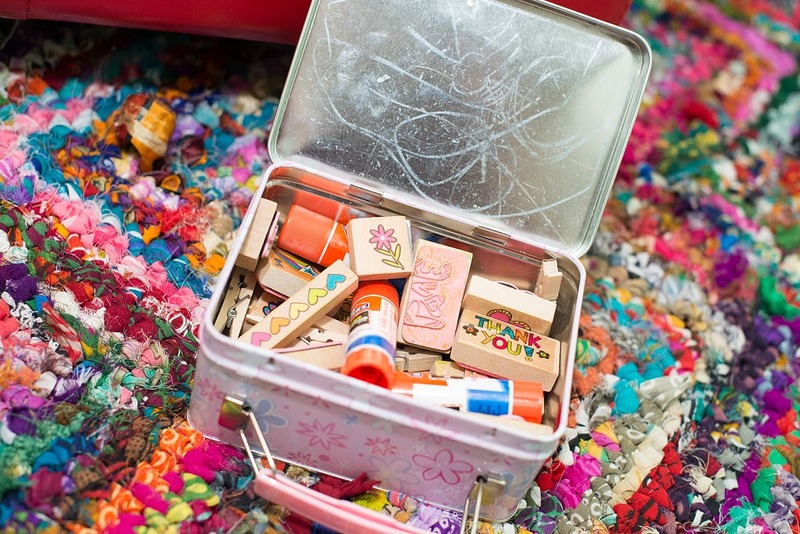 The floor was so littered with puzzle pieces, Legos, Barbies, and broken toys that you couldn't even see the floor. In fact, there was no floor- just a knee deep swamp of despair. I took a deep breath and dug in. The first thing I did was empty the closet and get rid of anything and everything we don’t actually use. Then I vacuumed up the bag of powdered sugar that had apparently exploded underneath all the mess. How it got there in the first place I have no idea. After the space was nice and clean, I decided I wanted to paint! 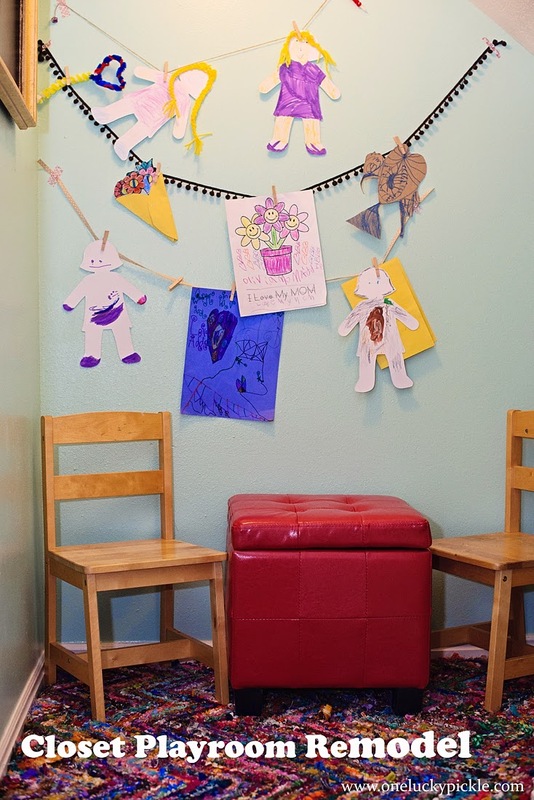 After all, what’s a playroom without some fun color?! I had a can of blue paint left over from an old project and used that to brighten up the space. While the paint was drying, I organized the toys. An old wicker basket now holds all the dress up clothes. 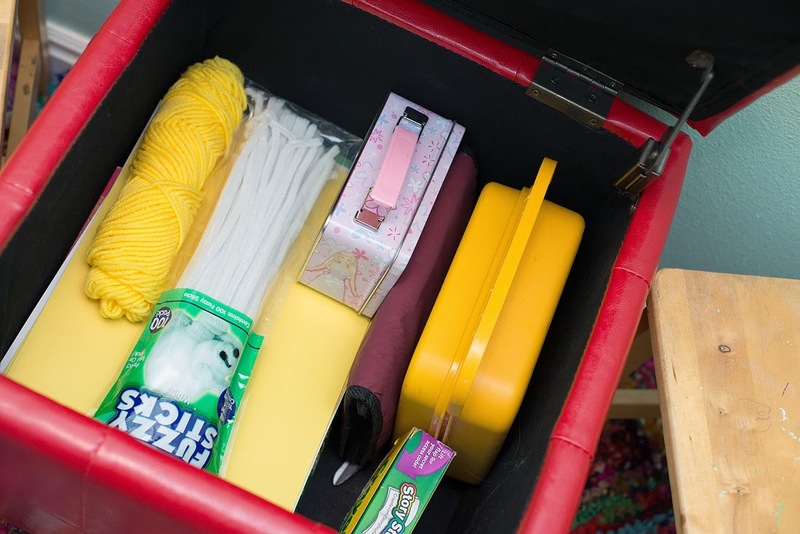 I happened to have some empty organizing bins in the attic, so I pulled those out and used them to store small toys and dress up accessories like hats, shoes and necklaces. (Ignore the ugly sticker... I don't know why I didn't pull it off.) 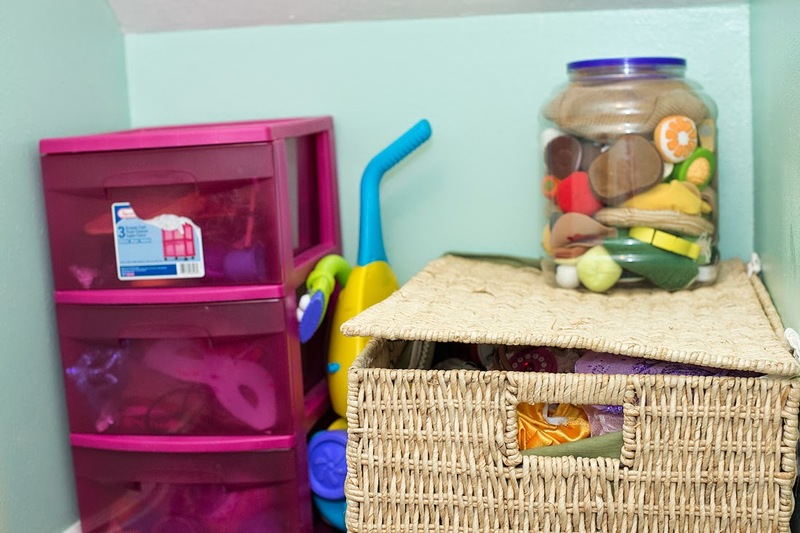 Then I used an empty container from Sam’s Club that used to contain cheese puffs (I mean… uh… organic chia-flax-spinach-kale chips) to store all the play food. 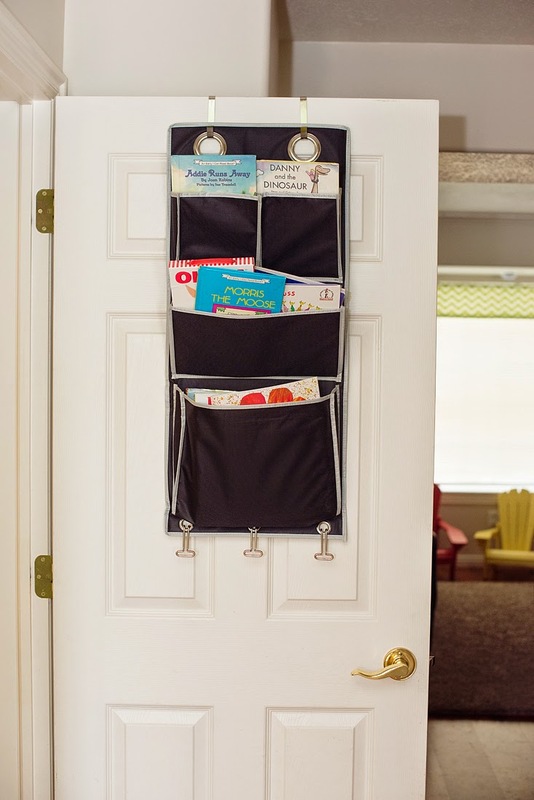 This over the door organizer holds library books, and a few favorites from our bookshelf… I plan to rotate through them so we don’t always end up reading the same books. 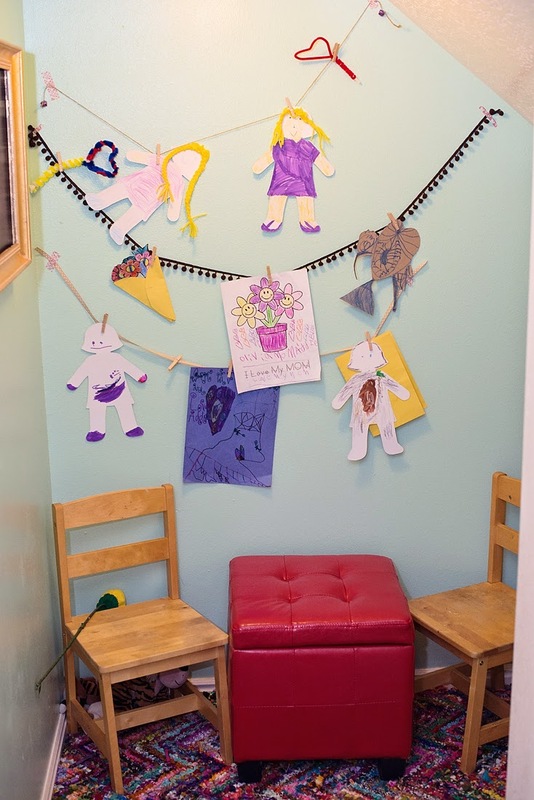 One of the biggest reasons I wanted a playroom was to provide some creative space for my kids. 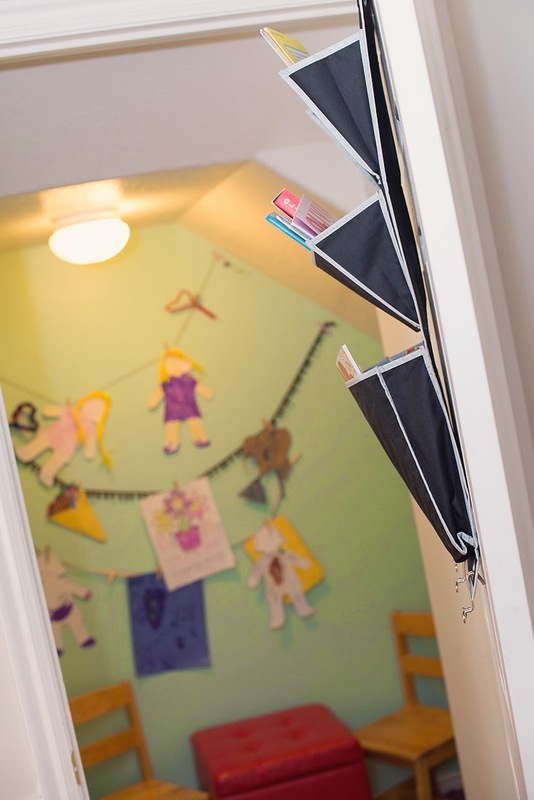 My older girls LOVE to make crafts and they just end up all over the house and stuffed into every crevice of their closets. 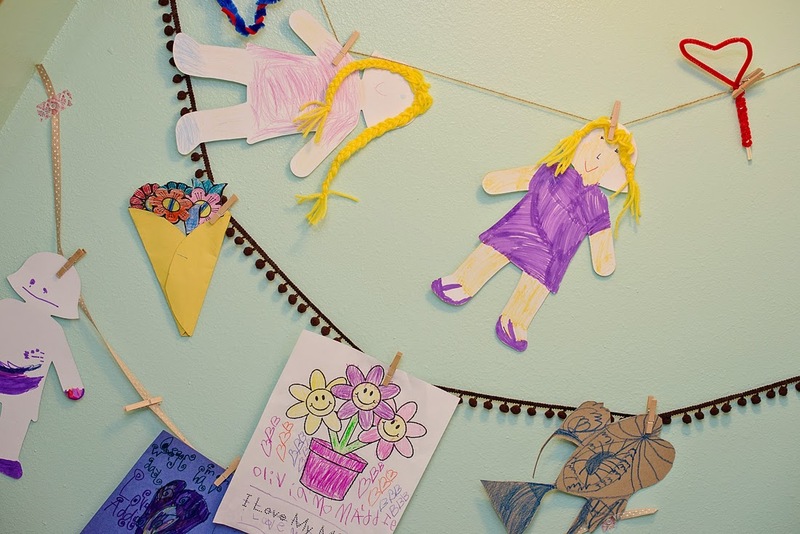 To solve the clutter issue I strung some twine on the wall, and used clothespins to hang up their masterpieces. If they want to put a new piece of art up, and there isn’t any room, they have to decide which piece they have to retire. That way I’m no longer the bad guy who sneaks old art projects into the garbage when no one is looking because I just can’t handle the clutter anymore. This totally rad ottoman now holds all the art supplies and also acts like a little table for pretend tea parties. An empty tin is now the home for the stamps and glue sticks. I seriously love this room! I know it’s small, but it’s so functional now! My kids spend hours in here every day, and I don’t know who is happier about it- them or ME! (Pretty sure it’s me.) They play dress up, do art projects, play house and their favorite make believe game- super spy! My oldest has also been using this room as a quiet place to do her homework. I think my favorite part of this whole project is that for the most part I just used items I already had on hand. The only two things I bought were the red ottoman and the super funky rug… both on sale at Ross! Score! Help Me With Mother's Day! Eeek. Yeah, I know--Mother's Day is on Sunday. I've been thinking about it for months, truly I have! I've just been so busy baking my very own person-al Mother's Day gift (see what I did there? Snort!! Cuz I'm going to have a baby in three weeks...Okay, I'm so not funny...), I haven't settled on what to create for all the mothers in my life!! 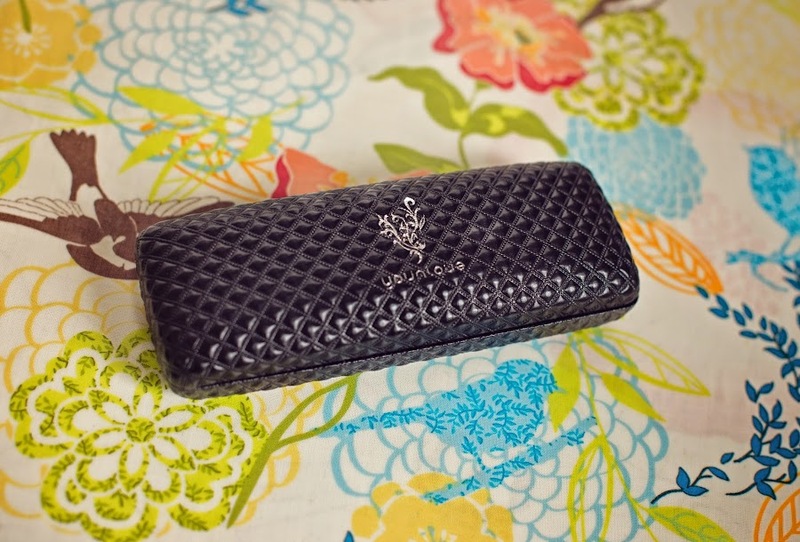 What are YOU gifting to your very most special mother? I was GOING to get a Bouq for my Mom and Mom-in-law, but I'm a little late for that... I suppose better late than never applies, right? I mean, who's going to turn their nose up at a Bouq? But I still need something to give them on Sunday. I'm kinda wishing I could reuse some of my past projects. 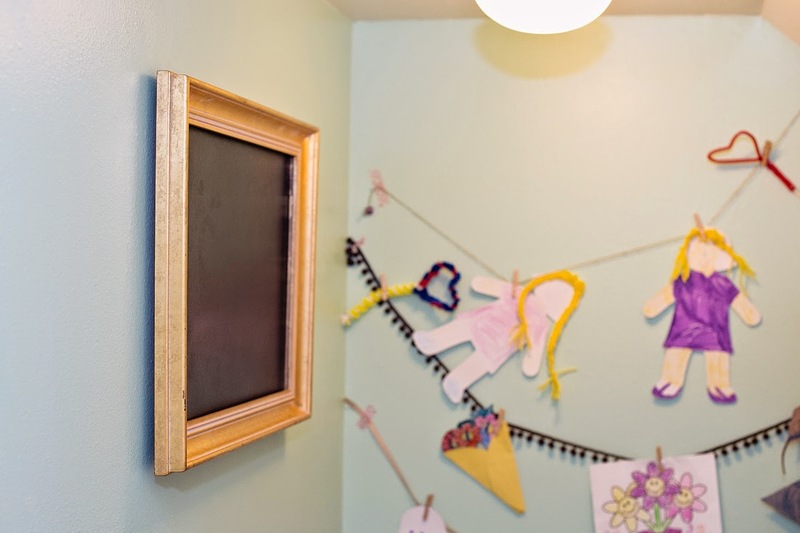 If you are in the same boat as I am, feel free to give these quick, fun projects a try! 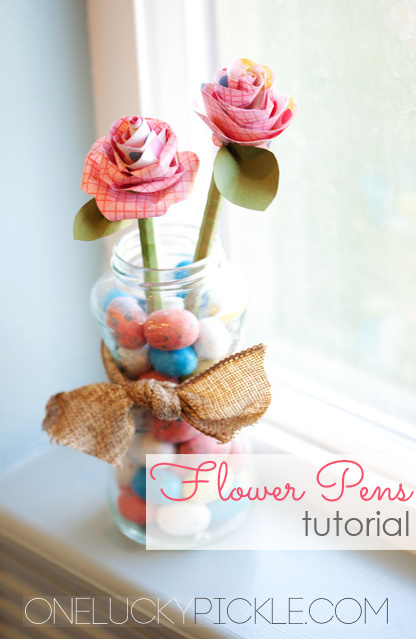 My mother-in-law still has her jar o' flower pens sitting by her phone--they don't walk off as easily as other pens. I guess all the boys that live there would rather find a more manly pen--PERFECT!! The downside is that she doesn't need any more...but I'll take the win. 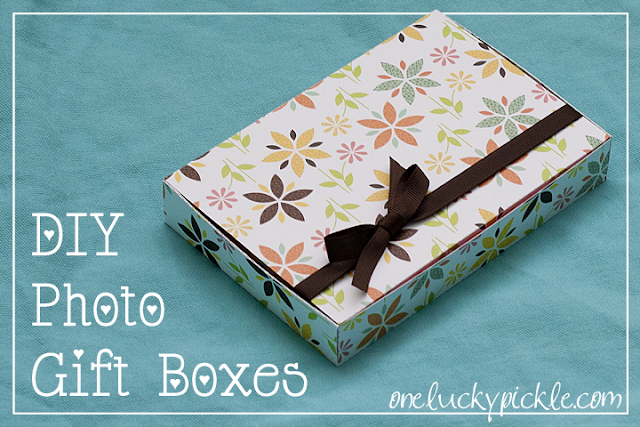 I suppose I could redo the photo gift box. Moms love pictures, right? Heaven knows I have enough paper to make a MILLION photo boxes. But I'm hoping for something new, something fast, and something amazing. So go ahead, comment quick, and give me some good ideas. Yes that's me! We're getting up close and personal today! Let's talk about make up! What is your make-up routine? Do you go all out every day, or are you more of a lucky-I-remembered-to-put-on-pants-today kind of gal? 9 times out of 10 I seem to be in the latter category... but I'm working on it. I want someone to come to my house and teach me exactly what I need to be wearing, and how to apply eyeshadow in a way that says "I'm a hot classy mama!" instead of "Shoot! I'm late for algebra." My routine consists of mascara, lip gloss, a touch of cover girl in a weak attempt to cover the ever-present dark circles under my eyes, and a little bit of the same brownish eye shadow that I've been wearing since the 9th grade. (Well, not the exact same one. I did manage to purchase a new one since then... but in the exact same color.) Yeah, like I said before, make-up just isn't my thing. Or rather... it wasn't my thing. 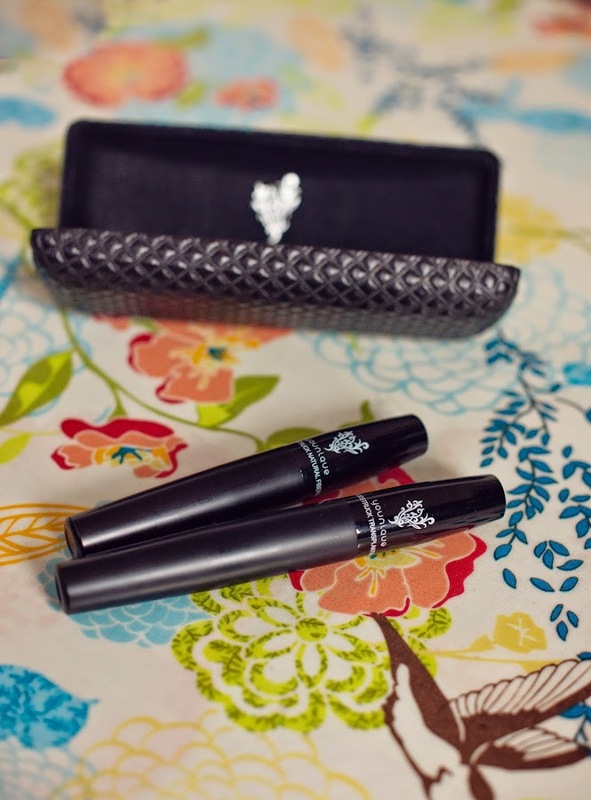 First impressions are extremely important, and this mascara makes a great one. Can we just talk about how cute the packaging is here? Holy cow. I feel prettier already! 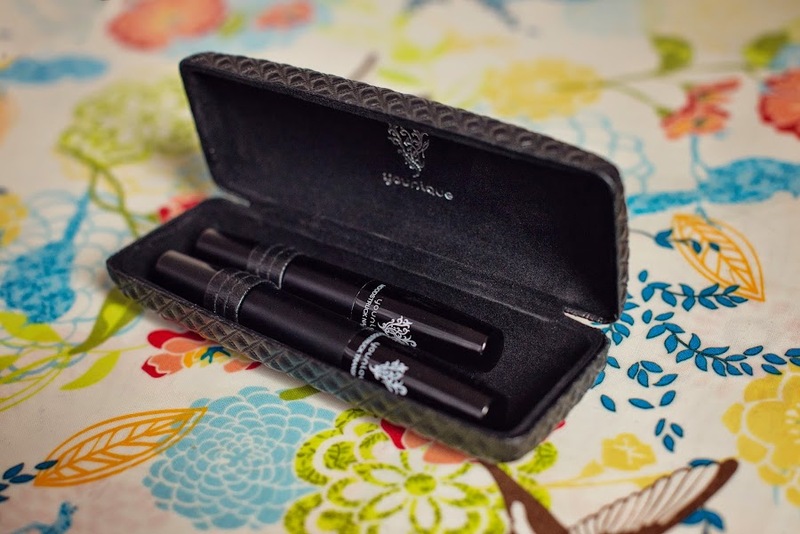 Open up the little case and you'll find two mascaras. The first one is the Transplanting Gel, which looks like your typical mascara. The second one totally threw me for a loop the first time I opened it. I wasn't sure what I expected, but it's basically just a brush covered in lots of teeny tiny black fibers. I couldn't wait to put it on! The instructions say to put on a base coat of your favorite mascara, and then the transplanting gel. Then while the gel is still wet you put on the natural fibers. Finally you put on one more coat of the transplanting gel to seal the deal. In the picture above I applied my make up as I normally do. I then used the Younique Magic Mascara on the left side, and my typical double coat of mascara on right side. Suddenly I am feeling like- what was the point of my normal mascara?!? You totally can't even tell I'm wearing any! Today was one of those days that I was running around all day long and didn't really have time for my whole make-up routine. So just out of curiosity I skipped the base coat of mascara underneath and only used the Magic Mascara. I don't think I can ever go back! Today I ran all over town with nothing but mascara on (Whoops! Remembered the mascara... forgot the pants! I kid. I kid.) and yet I totally felt like I was all dolled up because my lashes looked incredible. I caught myself batting my eyelashes a few times, but then I remembered I'm married and probably shouldn't bat my eyes at random strangers. The other thing I love about Younique is that their whole line of products is naturally based, and all but one (Rose Water) are Gluten Free! I know for the majority of you, that's doesn't seem like a big deal. But trust me, for those of us with severe gluten allergies it is a BIG deal! A huge THANK YOU to my friend Crystal who let me try out this amazing product. You can find more information about Younique's line of make-up at her website HERE. Oh! And I totally need to give photo credit to Olivia, my 5 year old daughter. She kind of rocks. I have tried to photograph this meal so many times. And I just can't capture the deliciousness. But it is yum yum yummy. Done in the time it takes to cook a pot of pasta. Cook pasta as directed on package; drain. While the pasta cooks, drizzle some olive oil in a large skillet and saute garlic and cayenne pepper over medium heat for 2-3 minutes. Stir in sour cream and chicken broth; simmer uncovered for 5 minutes. Remove from heat and stir in parm. 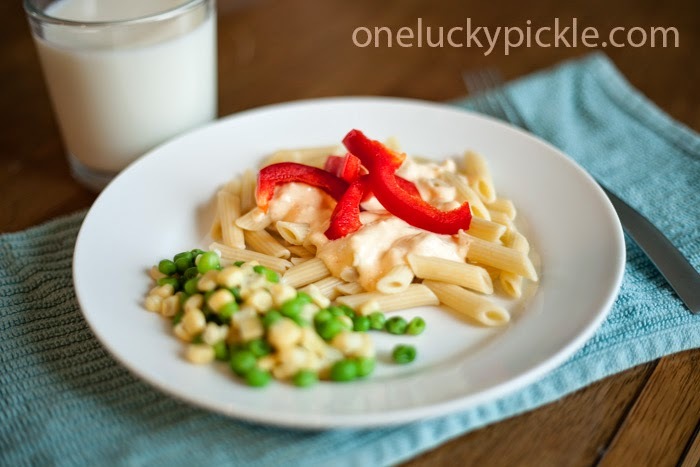 Toss hot pasta with sauce and peppers and season with salt and pepper to taste. OR--if your family has differing taste like mine, let them choose how much sauce and whether or not to include the peppers. I don't love bell peppers. So I'm a sauce only kinda girl. My husband loves the bell peppers, so he loads 'em in there. Both of our girls love the peppers, but prefer them on the side.